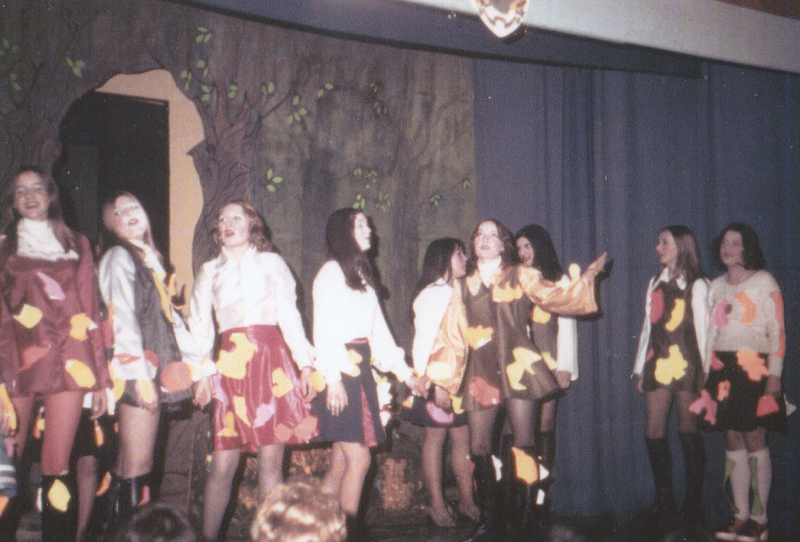 This was the Drama Club’s second production of one of the all time favourite pantomimes – ‘Babes in the Woods’ – with, as it appears from the number of names shown in the programme, to have had perhaps the largest cast since the joint School and Drama Club production of ‘Alice in Wonderland’ in 1964. All the usual characters are there – Maid Marian, Robin Hood, The Sheriff of Nottingham and, of course, the traditional Dame – Nurse Nappy! All the photographs of ‘Babes in the Woods’ are copyrighted to CMMF/Markhouse Drama Club. 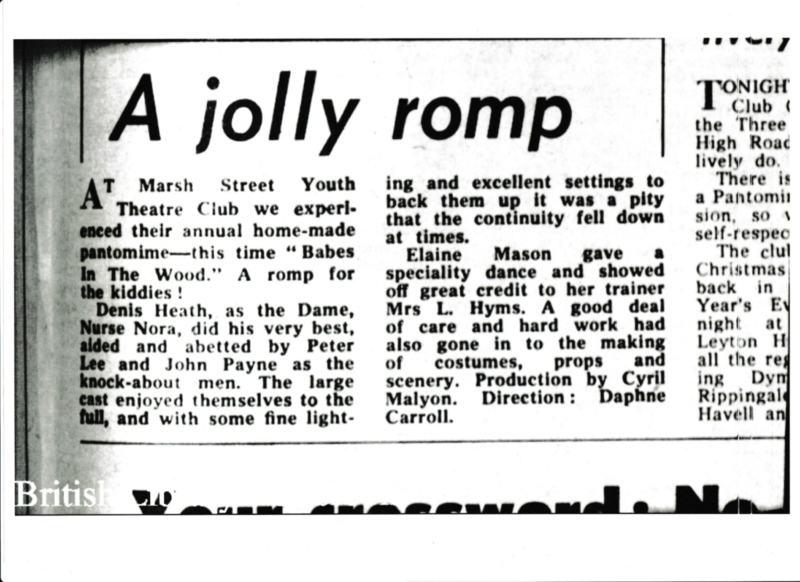 “As a result of the first ‘excursion’ to delve into the archives of the Walthamstow Guardian at The British Library, their report for this pantomime has just been been found – and is reproduced here – complete with the ‘all telling’ opinion quoted above – which is obviously correct!!!! At Marsh Street Youth Theatre Club we experienced their annual home made pantomime – this time ‘Babes in the Woods’ – a Romp for Kiddies!!!! Denis Heath as the Dame, Nurse Nappy, did his very best and was abetted by Peter Lee and John Payne as the knock about men. The large cast enjoyed themselves to the full and with some fine lighting and excellent settings to back that up, it was just a pity the continuity let them down at times. Elaine Mason gave a speciality dance and showed off great credit to her trainer – Mrs L Hyms. 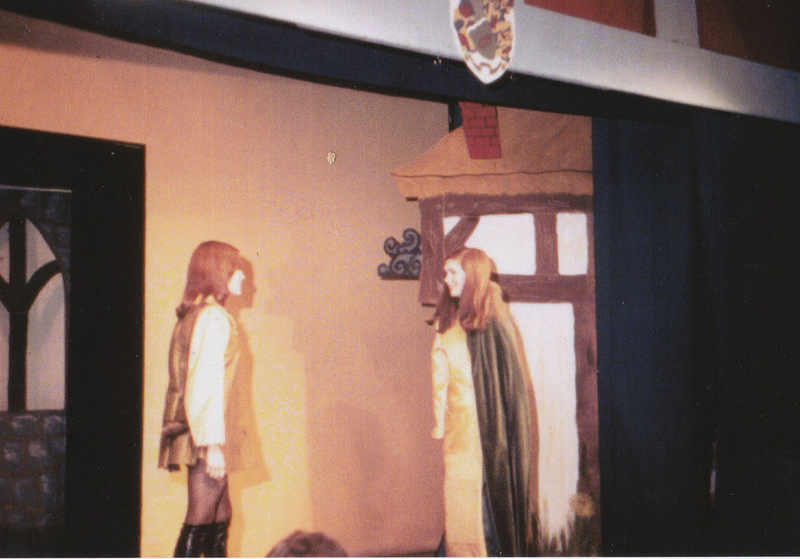 A good deal of care and hard work had gone into the making of the costumes and scenery.